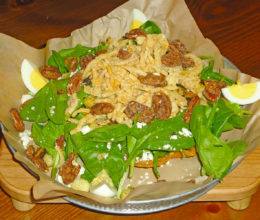 Sliced Hard Boiled Egg, Balsamic Candied Walnuts, French Fried Onions, Feta Cheese and Garlic Cheese Croutons on a bed of Whole Leaf Spinach. Applewood Smoked Bacon, Irish Cheddar, and Audible's Signature Guinness BBQ Sauce. Garnished with Lettuce, Roma Tomatoes and a Russell Championship Ring. 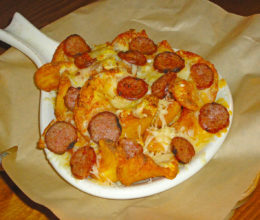 "Curly" Fries topped with Melted Shredded Cheese and Smoked Bratwurst. 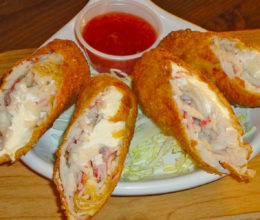 Crab and Cream Cheese rolled into two Egg Roll Wrappers and then lobbed into the Jacuzzi. Accompanied with Sweet Chili Sauce. ** Imitation crab meat. Not suitable for customers with shellfish allergies. Baked Brie Drizzled with Honey and Sprinkled with Candied Walnuts. Served with Sliced Apple and Grilled Baguette. Three Deep Fried Pickles and a glove full of Onion Rings riding the pine with Carrots and Celery. Served with Buttermilk Ranch. Button Mushrooms in a broth of Butter, Garlic and Chardonnay. Finished with melted Irish Cheddar and Baguette. 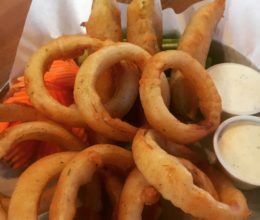 Two Handfuls of Sliced Onion Hand Dipped in our Homemade Sierra Beer Batter. Served with Buttermilk Ranch. Three Lettuce Cups filled with Carrots, Cucumber, Beets, Farro, and Avocado. Accompanied with Ponzu Sauce. Tender Pork Belly tossed in Audible or Sweet Chili Sauce. Served in Three Lettuce Cups with Farro and Crushed Walnuts. Coming in hot like the King of K's. Spiral Fries struck with Pesto, Jalepeños and Melted Shredded Cheese. All burgers are made with 1/3 lb. 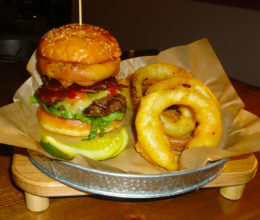 Certified Angus Ground Chuck and are served on a local Sugar Pine Bakery Sesame Seed Bun. Comes with your choice of either Spiral Fries, House Salad, or Championship Rings. Two patties stuff ed with Pepper Jack Cheese Juicy Lucy Style. 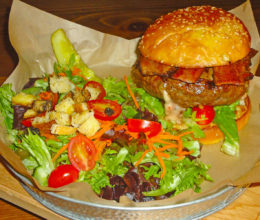 Topped with Lettuce, Roma Tomatoes and Applewood Smoked Bacon. A mound of Homemade Corned Beef pitched onto a Patty with Melted Swiss Cheese. Avocado, Lettuce, Roma Tomatoes, and your choice of Cheese. Hearty Black Bean Patty topped with Field Greens, Roma Tomatoes, Avocado, Pepper Jack Cheese and a drizzle of Audible Dressing. A Grilled or Blackened Mahi Mahi Filet caught with two Corn Tortillas and landed with "Mad" Salsa, Cabbage and Roma Tomatoes. Swims with your choice of side. Grilled Chicken, Bacon, Avocado, Bleu Cheese Crumbles, Roma Tomatoes and Sliced Hard Boiled Egg spiked onto a Bed of Field Greens. Field Greens, Toasted Farro, Roma Tomatoes, Sunflower Seeds, Shredded Carrot, Beets and Mandarin Orange Slices. Romaine Spears with Garlic Cheese Croutons, Toasted Farro and Parmesan. Drizzled with House Caesar dressing. 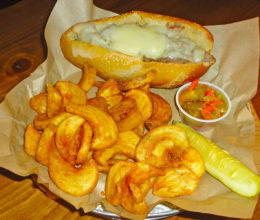 All Sammy’s are served with your choice of either Spiral Fries, House Salad, or Championship Rings. Thinly Sliced Roasted Sirloin Cannon-Balled into Homemade Au jus with a side of Giardiniera. Smoked & Grilled Bratwurst, Thinly Sliced Roasted Sirloin and Homemade Au just with a side of Giardiniera. Grilled Bratwurst topped with Grilled Pasilla Peppers and Onions. Spring Mix, Cucumber, Red Onion, Beets, Shredded Carrot, Avocado and Roma Tomatoes all layered and drizzled with Audible’s Goddess Dressing. Served on Marble Rye. Your choice of Blackened or Grilled Mahi Mahi with Audible’s Tartar Sauce, Romaine Lettuce and Roma Tomatoes on a Sugar Pine Bakery Sesame Seed Bun. Thinly Sliced Corned Beef smothered in Melted Swiss on grilled Marble Rye with Dijon Mustard. Hot Corned Beef and Sauerkraut with 1000 Island dressing on grilled Marble Rye with Melted Swiss. Just like the Hit King, this one should be in the Hall of Fame. Grilled Chicken Breast with Melted Brie, Spring Mix, Roma Tomatoes and of course Pesto. Seared Chicken Breast that is Blackened with our House Rub. Topped with Bacon, Swiss and Spinach. 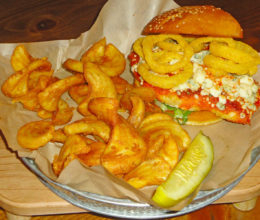 A Grilled Chicken Breast topped in French Fried Onions and Crushed Funyuns. 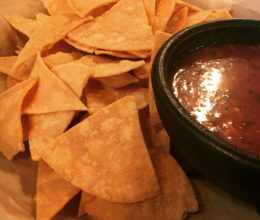 Tossed in Audible Sauce and finished with Melted Bleu Cheese Crumbles. Garnished only with Lettuce. Grilled Chicken Breast, Prosciutto, Swiss Cheese, Iceberg Lettuce and Dijon Mustard. No Menu Items found. Add one now! Named after the year when hard root beers soared in popularity with Colonial drinkers, the brew features ingredients such as blackstrap molasses, sassafras root bark, dried wintergreen and licorice. Cloudy, reddish colored brew with coppery amber hues around the edges. Massive, minty nose, with soft sassafras, vanilla, a wet and earthy root character and gingery suggestions. Medium-bodied, smooth and even. Very spicy with cracked black pepper all over the place, almost gingery at times. Rich and robust molasses tanginess and deep sweetness blends well with delicious notes of licorice and subtle vanilla, while a raw and intensely herbal sassafras dominates. Wet root or green twig notes. Touch of sourness and some lemon-like character blends with the sweetness. An Asian sweet-and-sour sauce comes to mind. Suggestions of fresh wet tobacco, with a big, fresh, minty, leafy character sticks into the finish and lingers long. Raw, floral honey notes pull through as the beer warms. Finish is a bit rough and raw. The experience is intense and complex and truly brings your sense and mind back to another era of elixir enjoyment. However, it’s not an easy brew to get down your neck. Flipping the tab on the 500 ml can issues a crack and a hiss, and an immediate scent of steel, mustiness and toasted malts. We pour the beer into a nonic glass, noting its deep (but clear) brown and copper hued, topped with a short-lived white head that drops to a thin ringed lace. The aroma is a bit gummy, with some mustiness and a good dose of toasty caramel beneath, and notes of biscuits and cellared apples. Silky-smooth on the palate, with a full, even and rounded body. Up-front sugary sweetness paves the way for more complex flavors of toasted malts and toffee; and subtle notes of chocolate, roots, chicory and jam-like forest fruits. Dots of honey here and there, with some watery molasses. Hops are soft, with light floral and herbal flavors, and complement the malty sweet backbone of this beer quite nicely. Sweet and toasted bread lingers in the finish, with herbal tea notes and a touch of dry biscuit and underlying nuttiness. © Copyright 2017 Audibles Lake Tahoe. All rights reserved.